Click on the links to see images from each show. The Maximum Wage Screenprint Production Line runs for 20mins every hour. “Wages” paid to players can be used in the venue and in participating local businesses. Each player’s “wage” is determined by their randomly allocated status and a spin of our wheel of fortune! Will your earnings be capped at 10:1? 100:1? 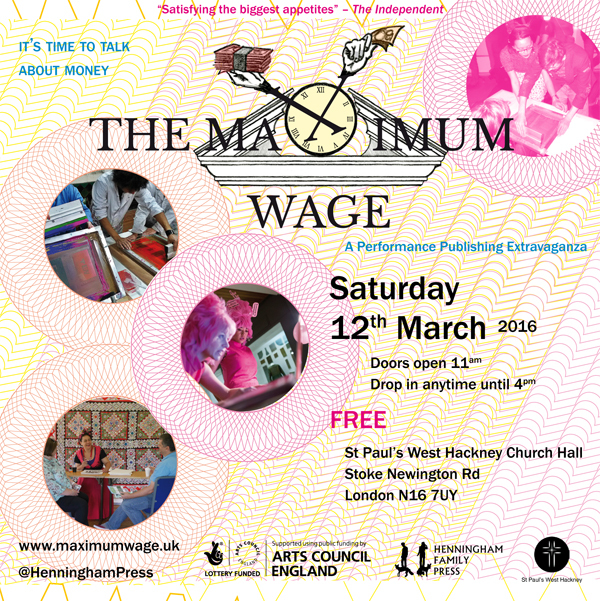 The Maximum Wage Magazine is now available to buy! A 72-page A4 full-colour glossy magazine splashed on every page with photos from the live show and packed with brand new art and articles on earning a living. Only £3.50 & FREE DELIVERY within the UK! Buy Now via Henningham Family Press! £3.50 & FREE DELIVERY within the UK! Artist Marion Macalpine reveals a new and unreported threat to hospital estates. AND Julie Rafalski shares out the commonwealth pie. Ladies Of The Press subvert lifestyle magazines to sell you back to your Self. Sophie Herxheimer collects life stories. Janice Macaulay‘s treasure trove of thrifty tips. Julie-Rose Bower dismisses the CV. Four pull-out posters Smash Hits stylee. Orwell vs Osborne on a living wage, Salary Amnesty and more! Henningham Family Press are your hosts on this money-printing factory gameshow! Live printing mayhem meets Wheel of Fortune! Artist Julie Rafalski charts what we are entitled to from the commonwealth pie. What were you doing when they told you to earn a living? Artist Sophie Herxheimer will collect and illustrate your stories. Artist Janice Macaulay and her Transformation Trolley will reinvest your talents. Swap money saving tips with other thrifty types. Make a pledge with her fridge magnet machine. Ladies of the Press* – Live Press! Ladies of the Press* are making a live zine throughout the event! Publish your ideas at their Press Desk! Grab a copy while stocks last! Today, income inequality remains one of the stickiest problems Britain faces. It affects social mobility, healthcare, crime and much, much more. The Maximum Wage brings Orwell’s proposal to life, stimulating public conversation and moments of clarity about what money is and how we earn it. It’s time to talk about money. Inside the venue, it’s hectic, a little ramshackle, with a DIY, handmade aesthetic. It’s as far as you can get from the white cube art gallery experience. Although the art world may be driven by money, you feel a little uncouth if you actually ask how much something is. Here the mechanics of making and spending money are in the foreground and in your face. You’re being asked to think about wealth and value, and how these are not objective facts but constructed ideas.